Gregg White is of Mi’kmaq descent and is a member of the Flat Bay Band, part of the Qalipu Mi’kmaq First Nation, N.L. He currently lives and writes in Halifax. When the caribou herd moved on, and the moose hunkered down in the snow, we moved to the ice. We were out on the ice in the muddy hole near the mouth of the Flat Bay Brook. Ice, that because of the flowing river near it, never got too thick, which was both convenient for our task and also dangerous. Ice that had a slimy bounty beneath it nestled in the deep river mud. Ice that could barely hold the weight of one man, let alone 40. Yet still we moved to the ice, because it was the only place we could go. They moved across the ice deftly; grown men venturing onto the ice where most others fear to tread. The “slimy” bounty are eels, and for hundreds of years the Mi’kmaq of Nova Scotia and Newfoundland used eels as a staple of our diet. A delicacy for the rich in other cultures, the Mi’kmaq harvested eels more regularly and in all seasons, but they became particularly valuable during winter when the larger land game was scarce. One of the more interesting ways to harvest eels in winter, the way that my father showed me, was to spear them through a hole in the ice. Now, if you’re imagining people standing at the edge of the water, spear at the ready, able to deftly stab a swimming eel from a throwing distance, I will forgive you. But that image would be wrong. The method was not as glamorous. In fact, it was quite simple, but very effective. The process involved cutting a circular hole in the ice, usually around half a metre in diameter, with an axe. Once the hole was cut, the fisherman would gently thrust a three to five metre “spear” deep into the mud over and over again, until he either impaled an eel on one of the prongs or he was sure he had covered the entire diameter of the hole. The tips of the spear were curved upward, so when the man pulled the spear back up toward him, the eel became hooked. A fisherman could tell if an eel was impaled by sensing the feeling of the spear, and I have seen men, sensitive to the tiniest of vibrations, know exactly when eels, little bigger than worms, were hooked. Bountiful holes could yield 30 or more eels, and when the fisherman was sure he had covered every inch of reach his spear would allow, he would move on and cut another hole. For hundreds of years the Mi’kmaq of Nova Scotia and Newfoundland used eels as a diet staple. The thickness of the ice was directly related to the amount of mud you could spear. The thinner the ice, the further you could reach into the river mud, making the circle you fished bigger. As a result, I have seen men go onto the ice when they had no good reason to be there. Well, one good reason I suppose — hunger. They moved across the ice deftly, grown men venturing onto the ice where most others fear to tread. Oftentimes the ice would roll like actual waves beneath our feet, and you had to keep moving before the ice could give way, rewarding you with an icy swim. At the end of the day, the eels had to be skinned. The task was a little challenging when you consider that by the time you got them home, the eels were covered in slime and ice, often making your fingers numb before you got the first one done. To skin an eel, you make a cut across the underside near the head, then run your knife along the belly down the length of the eel to remove the innards. Then turn the eel over and make a cut on the other side of the eel, again near the head, just enough to pierce the outer skin. Grabbing the fold in that skin you just created, you pull on it to peel the slimy outer skin away from the meat, using one swift pull until the entire skin is removed. 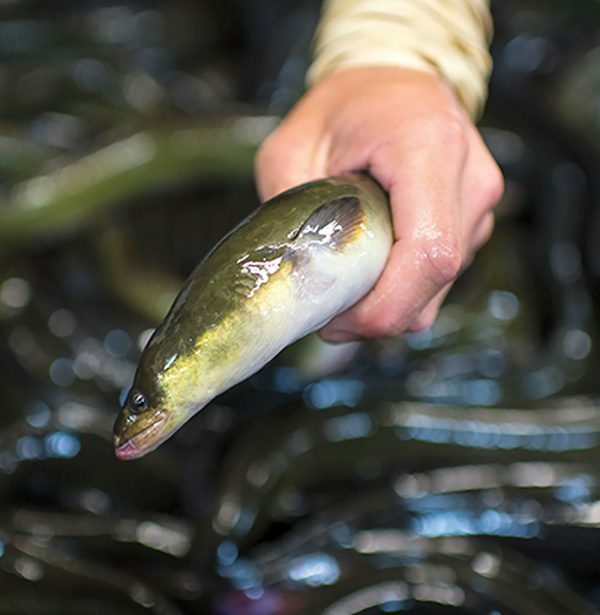 This cold and time-consuming process was made more challenging by the fact that the nerves of the eel would continue to cause it to squirm and twist well after its “throat” was cut. Why risk the danger of the ice and the biting cold of a Newfoundland winter? The payoff, of course, was the delicious eels. Baked, prepared in stews, or fried in pork fat, eels are packed with vitamins and protein, a perfect staple to the Mi’kmaq diet when moose and caribou reserves were low. Many a family relied on this fish to survive, and in Flat Bay we were blessed with an area that provided plenty.